Bugattis were always known the world over as highly valuable collector’s items with plenty of prestige and history behind them. However, very few people comprehend how genuinely valuable these vehicles are to privileged collectors throughout the automotive world. Many of Ettore Bugatti’s one-of-a-kind creations command upwards to millions of dollars in auction houses across the globe, only to be displayed at museums and special venues such as the Pebble Beach Concours d’Elegance. To highlight the steep asking prices asked of these vehicles, take a look at this brief list of the most expensive Bugattis to ever cross the auction block. Santa Monica-based auction firm Gooding & Company had the privilege of selling one of the most expensive Bugattis in existence to an undisclosed buyer. 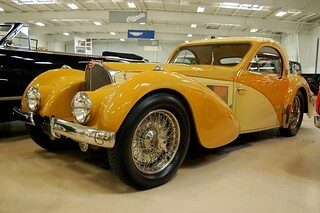 Once owned by deceased neurosurgeon and car collector Dr. Peter Williamson, this Type 57SC Atlantic is one of only three such vehicles ever built. Williamson joined the ranks of Ralph Lauren and others who owned these very rare rides. This vehicle received previous accolades as the winner of the 2003 Pebble Beach Concours d’Elegance. The auction firm sold the vehicle to an undisclosed buyer for a sum of $30 to $40 million dollars. At a gigantic length of 15 feet and height of five feet, this Bugatti remains one of the biggest and most expensive ever built and it also remains one of the most expensive ever sold at auction. The Royale was intended for a particular clientele for whom money was no object. Unfortunately, production of this vehicle came at a time when no one could afford to spend a fortune on anything, let alone what was considered the ultimate luxury car. Under the hood is a massive 12.7-litre straight eight-cylinder engine originally created from half of a 16-cylinder aircraft engine. Six of these incredibly imposing vehicles were produced, but never sold to its intended clientele. To avoid having it confiscated by the Nazis, the Bugatti family kept it hidden behind a brick wall for the duration of the war. Eventually, the Bugatti estate sold the vehicle to sports car constructor and Le Mans driver Briggs Cunningham, who later transferred ownership to Miles Collier. In 1987, Christie’s of London sold this vehicle to Hans Thulin for $9.7 million, who later sold the vehicle to its current undisclosed owner for a reported $15.7 million. Based on the Aerolithe Electron Coupe of the 1935 Paris Auto Show, the Atalante Coupe differed from its Atlantic cousin in many ways, most notably eschewing the dorsal seam that ran the length of the Atlantic’s body, instead incorporating a single windshield and kidney-shaped side windows. 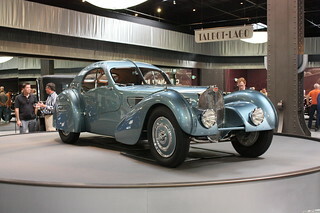 Originally finished in black, Jean Levy of Strasbourg first took delivery of this particular Atalante Coupe. The low-slung Bugatti eventually ended up in the hands of casino magnate William Harrah, who commissioned a complete restoration, one which involved a change in color scheme. Gooding & Company recently sold this vehicle for a cool $7.9 million. Louis Rix, Marketing Director at Netcars.com, writes regularly on cars for a range of blogs and online publications including the UK’s finance specialist CarFinance247.